A few months ago we were driving through beautiful southern California, up and down winding roads, oohing and awing over the picturesque scene. Our GPS beeped and we slowed down, looking at the mailbox numbers for our destination (we've been known to knock on the wrong door before).Then we saw it - a hand-painted signpost of the 101st Screaming Eagle crowned by the word: Airborne. No mistaking... we were at the right spot. When Bill Galbraith was a young boy, he once got into trouble in art class for drawing a sunken Spanish Galleon surrounded by the vast ocean, instead of the modernist depiction of the ocean-life the teacher had expected. The teacher marked up his picture, and in return he called her a nasty name. The years went on and this imaginative young boy grew up (as all children seem to), but he didn't lose any of his creative or resourceful characteristics - though there was certainly a good dash of mischievousness in the mix. All this would soon come to play an unexpected part in his life when he found himself lying in a hospital in England, his future in question, after being seriously wounded in the leg and shoulder during the fighting around Eindhoven, Netherlands. Paratrooper to the core, Bill had jumped with the 101st into Normandy during the wee hours of June 6, 1944. The fighting had been awful, but he made it out in one piece and was sent back to England with his unit for more training. When September 17th rolled around, he made his second combat jump into Holland for Operation Market-Garden. Unfortunately Market-Garden did not go as planned... but Bill wasn't around long enough to find out. On the 18th, during some street fighting near Eindhoven, he was hit in the leg by shrapnel from one of the infamous 88's. Crawling around the doorway of a house, he tried to see where the shooting was coming from, hoping to put a stop to it. At that moment he was hit again, this time in the shoulder. Falling back, helpless, he hit against the door of the house. The door suddenly opened, and a pair of strong Dutch hands dragged him in to safety. Bill's wounds were nearly fatal for him. If it wasn't for a recent medical discovery, he would have lost his leg and been an invalid for life. Even with this blessing, however, it still took three years of intensive operations and rehabilitation treatments to fully heal his wounds. The process was long and painful, and at times no doubt seemed hopeless. But this is where the tenacious spirit of the little boy who drew sunken Spanish Galleons for school played a part. A few months ago when we were in California for the Iwo Jima Reunion, we realized we were only a few short hours away from our dear and lovely friend, Mr. Galbraith. After calling him up with short, short notice, we stopped by for a visit. His drive-in was unmistakable with the Screaming Eagle he had painted on a post by the mailbox. It made us smile. He had told us about the wonderful eagle that protected his home, but it was something else to see it in person. 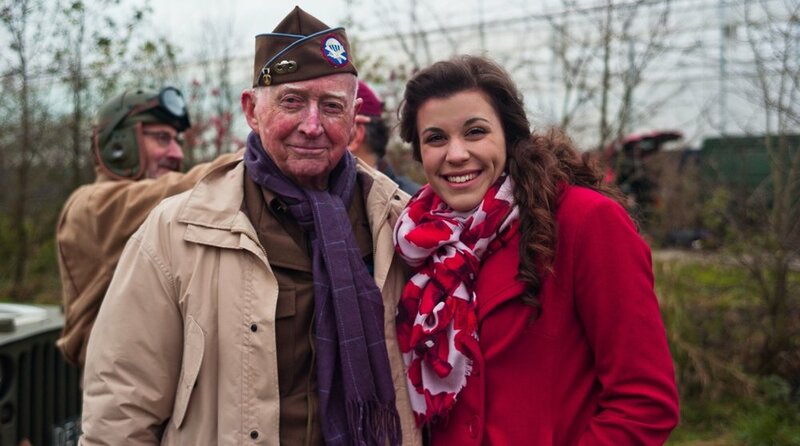 His last combat jump might have been in 1944, but he was still a Paratrooper! During our visit, he talked with us about his life over the years, the bonny Scotch/Irish war-bride he brought home to America, his magnificent paintings and drawings (it was no surprise to see countless paintings of ships sailing in fierce gales, surrounded by brilliant Screaming Eagles! 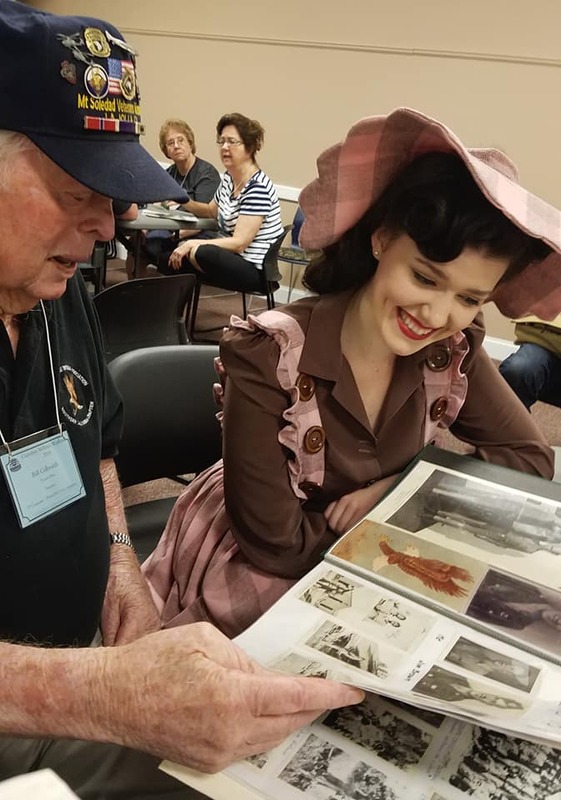 ), and walked us down memory lane as we poured through a scrapbook of photos and stories from WWII to his paratrooper reunions in later years. I'll tell you this, there is nothing quite like going through an old scrapbook and listening to the stories about each person, place, or event in the photos. We laughed at the funny stories, awed over the sweet stories, and got misty eyed as he showed us the pictures of his best friends who were lost. A lifetime of stories collected so neatly into one book. Of all his fantastic stories, one that continues to stick out is what happened while he was in the hospital. Determined not to be overcome and unwilling to live in a constant foggy state from pain-relieving drugs, this imaginative boy turned United State Paratrooper decided to focus his mental energy on learning poetry. Line by line, day by day, month by month. Replacing pain with verse. Poetry of all sorts, but specifically the works of Robert Service, "Bard of the Yukon." And it worked! Between drawing wonderful pictures and memorizing glorious poems, these mental exercises did not leave much time to dwell on the pain. In mid-1947, he was released from the hospital, and the wounds became a thing of the past. However, 73 years later, he can still recite those verses he learned, whiling the hours away with his hospital chums. Recite *perfectly* I should add. As we sat in his living room, listening to him repeat from memory such classics as Dangerous Dan McGrew, The Cremation of Sam McGee, and The Sourdough Story, we couldn't but pick our jaws off the floor at his impeccable memory for verse. There are so many lessons to learn from our dear friend Mr. Galbraith. His devotion to his fellow paratroopers was unquestionable. Never once was it "me" or "I." It was always, "we" or "they." "They were the brave ones." "We were like brothers." The camaraderie and loyalty between these men is surely one-of-a-kind. His love for his wife is another lesson for us. An Irish girl, living in Scotland, he persuaded her to come to the unknowns of America and be his wife. Married 65 years with 10 beautiful children (he beat our family by 2! ), it's a beautiful story for another time. But I think the lesson from this story - the story of Spanish Galleons and Poetry - is that the little boy whose imagination ran away with him in art class later had the impetus to stretch his mental strength and put his mind to work, rather than take an easy way out with pain-medications. The pain went away, but the treasures he has stored in his memory have lasted for close to 75 years. How important is this mental battle! And the rewards reaped afterward are ever so wonderful. Toccoa, Toccoa... one of the sweetest and most darling places in America. The last several months have been pretty busy with life in general. After looking at the blog and realizing it had been nearly 2 months since the last post, we figured it was time to do some catch-up work. So, instead of going too far back, I'll just start with Currahee Military Weekend. 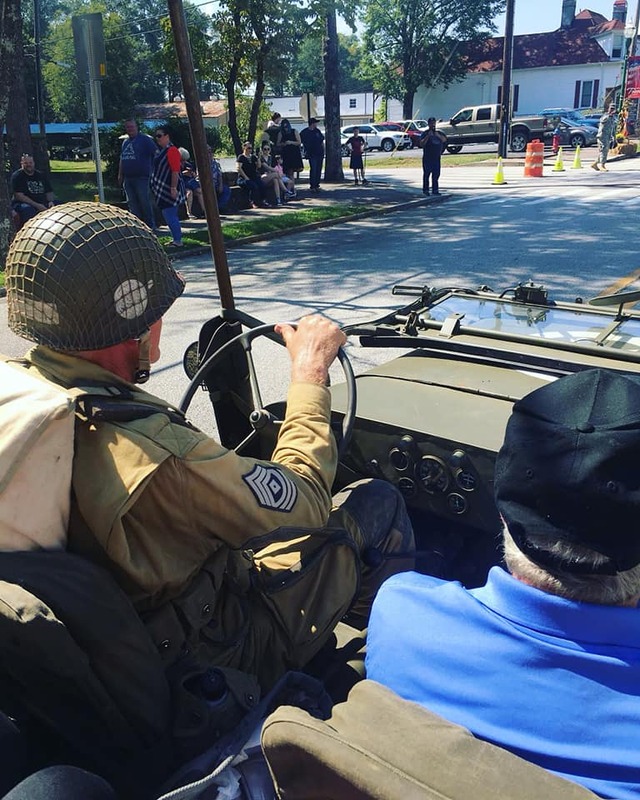 In the beginning of October, the town of Toccoa, Georgia hosts their annual Currahee Military Weekend in honor of the men who trained at Camp Toccoa in WWII. These men were United States Paratroopers. One paratrooper we talked to once said, "We were the baddest of the bad, and the biggest troublemakers." That is for sure. It seems that most of the stories they tell end up with fistfights or an attempt to capture a town single handedly (encouraged not a little by the belief that one paratrooper was more than equal to at least half a dozen regular Army men). But paratroopers are also known for their fierce camaraderie. You may be a stranger, but if you wear the jump wings, you are family, and they'll stick to you through thick or thin. This bond is something almost unexplainable to an outsider. Part of the unique history of Toccoa is Currahee Mountain. It was originally used as a significant element of the paratrooper's training (running up and down in full gear), but since then has grown in legend, especially after it was immortalized in the TV mini-series "Band of Brothers." Since we first visited Toccoa in 2014, we have tried to make it a point of running the mountain each time. Now, I've run several half-marathons over the years and found them to be in varying forms of difficulty. But nothing compares to Currahee. The famous quote, "3 miles up, 3 miles down," pretty much summarizes the intensity of the mountain. It is no cakewalk. However, putting all difficulty aside, it has to be one of the most inspiring places I've ever run. To know that every step you take is in the exact footsteps of the paratroopers. The paratroopers who dropped into Normandy in the early hours of June 6, 1944. The paratroopers who earned their name bravely defending Bastogne. And the same paratroopers who eventually stormed Hitler's elite getaway -the Eagles Nest. It is a pretty awe-inspiring thought, and definitely the only thing that gets me to make it to the top of the mountain and back. Singing old love songs with sweet paratroopers and listening to riotous stories of hospital escapades is pretty much the best. Besides, who doesn't love a paratrooper?! Over the course of the weekend, veterans who trained at Camp Toccoa in WWII come back (some for the first time since they trained in 1943! ), and there are book signings, chatting, music, parades, and everything possible to make the time fabulous. Toccoa is a small town, but it has a heart as big as Texas. We knew after the first day there that we had quite lost our hearts to this darling place. One of the best parts is reconnecting with old friends. And one of the best surprises for us was in the form of these two WW2 vet cousins. We had met them the first year we attended, and had just the best time with them, chatting about Gene Autry and Tank Destroyers (a great combination, don't you think?). Garnett (left) was on a Tank Destroyer and had his fair share of experiences over in Europe. His descriptions of tank battles and coming upon German concentration camps ("you could smell them miles and miles away") were remarkable. Interestingly, one of the men in his crew had been born and raised in Germany before coming to America. One day they were going through a small German town and this buddy pointed out, "This is the town where I grew up. That window is where my Aunt lives." His cousin DeWitt (right) was with the Engineers in Italy. However before going overseas, when he was 16, he had hitchhiked 300 miles from Demorest to Brunswick, Georgia to work with his uncle at the shipyard there. They are quite the pair of cousins! On Sunday morning, a memorial service is held at the Camp Toccoa Currahee Memorial. It is a beautiful ceremony complete with honor guards and taps. Following this comes a highlight of the week, breakfast at the local diner with the veterans. One of the lovely veterans we met was paratrooper Bill Galbraith. 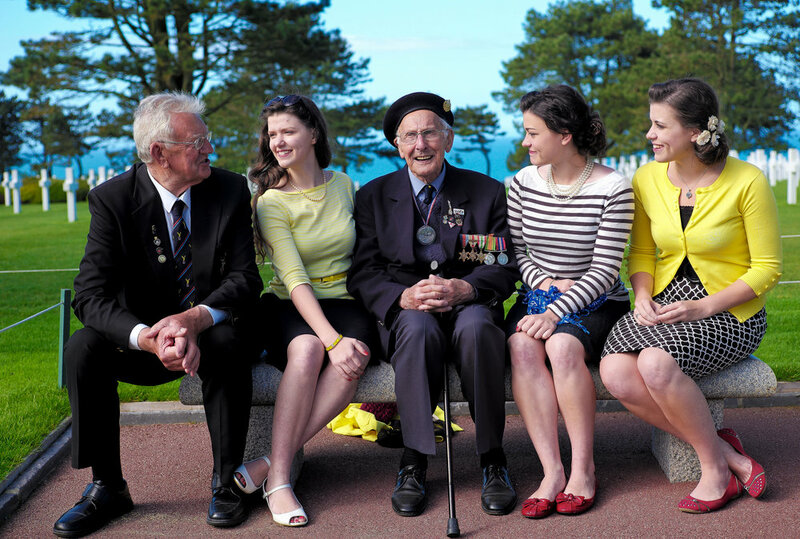 Mr. Galbraith jumped with the 101st into Normandy on D-Day, and then again into Holland for Operation Market Garden. On September the 18th, 1944, the day after landing in Holland, he was severely wounded and shipped off for treatment. His recovery ended up being a long, tedious, and painful process. To combat the pain, he concentrated on memorizing poetry, good hearty poetry though, the likes of Robert Service and others similar. Well, as Robert Service is a favorite in our house, we talked at great length about this, Mr. Galbraith reciting numerous poems perfectly from memory. It was absolutely fabulous. There are more stories from Mr. Galbraith, but that's for another time. Currahee Military Weekend 2016 left us with many wonderful memories. We listened to stories that made us cry, as well as stories that made us hold our sides with laughter. 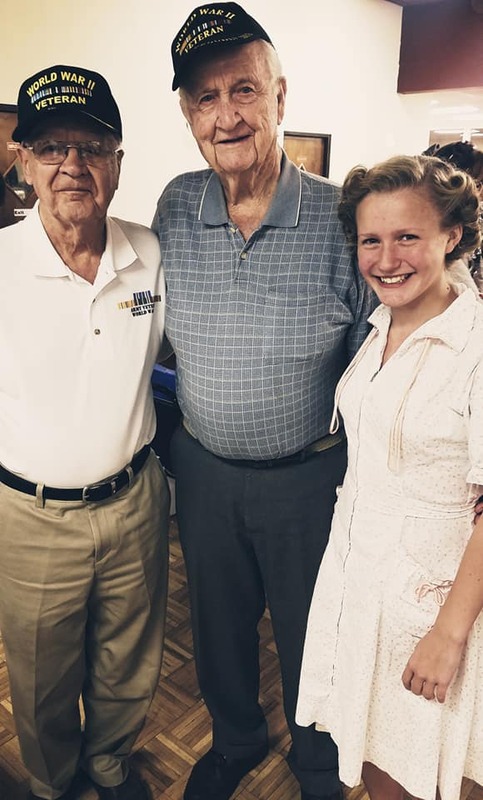 We sang old love songs with 90 year-old paratroopers who are still young at heart; and we talked about their war-time buddies -some who came home, and a few who didn't. Last but not least, we remembered the 6,000 soldiers who trained at Camp Toccoa and forever became "Toccoa Men." This is the dashing Mr. Carl Porter. I first met him a few months ago when the 508th PIR Reunion was held in San Antonio. Though Mr. Porter was a Normandy D-Day veteran, had a dramatic experience surrounding his capture and escape from the Germans, received the Purple Heart for attempting to disarm a "jerry-rigged piece of enemy ordinance," and many other paratrooper-esque events which happened to him in WWII, in retrospect I realized that little of our conversations at the reunion surrounded his war experiences. Instead, we talked about the beautiful 67-year marriage he had with his wife "Marly," their life together in Alaska, -and one of my favorite musical artists (and his "namesake" as we joked), Cole Porter.